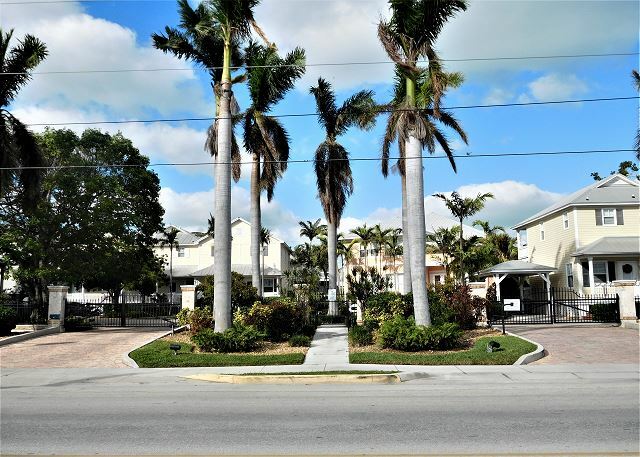 Coral Hammock is one of Key West gated communities. 55 luxury resort homes with a lavish Pool and lushly landscaped grounds. 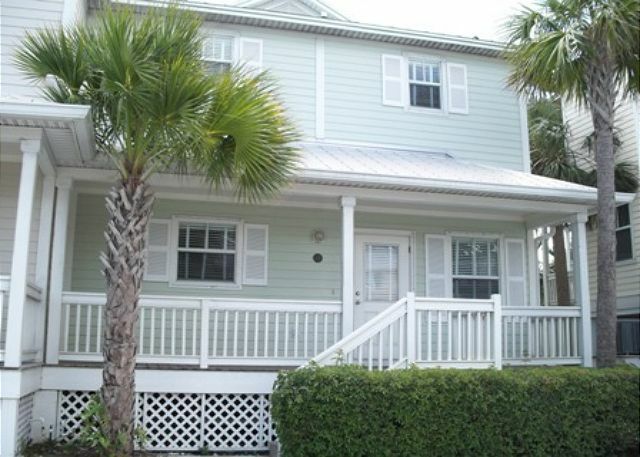 These custom single family homes recall the romantic charm of old Key West with spacious floor plans, vaulted ceilings, "Conch" style porches and the traditional metal roof. Located at "mile marker 5" and ideally located across from the Key West Golf Club and just down the street from world class fishing and other activities at Hurricane Hole Restaurant and Marina. Walking distance to CVS Pharmacy, and some of Key West best known restaurants, bakery and deli. You are close to all the action but yet secluded enough to enjoy your privacy. Key West is only a "3x4" island (three miles wide and four miles long) so nothing is far away!! The unit has three bedrooms and three baths. The unit has two kings and two twin beds and is fully furnished with the best of everything. 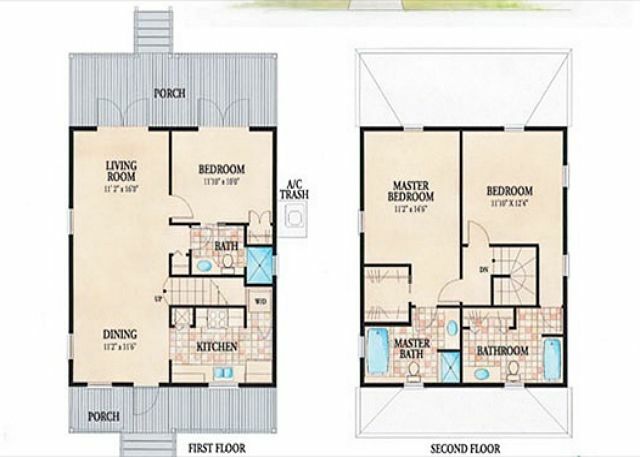 Floor Plan Features a Fully Equipped Gourmet Kitchen, Dining Room, Living Room, Bedroom, Full Bathroom, Front Porch & Back Patio/Deck on the First Floor. Two Bedrooms, Two Full Bathrooms, Washer & Dryer, and Balcony on the Second Floor. All furnishings are DELUXE! Parking for two vehicles is included. Our stay at 34 Coral Hammock was amazing. The property was in great condition and was very comfortable. It was very clean and had all of the necessary items to make our stay fantastic. The facility was quiet and secure. I would recommend this to any family looking for a relaxing and fulfilling vacation. First of all... I just want to say the owner of this property is one of a kind. We had some scheduling issue that came up in our family and he was over he top accommodating when it came to modifying our stay. The condo was cute and tidy with close proximity to the community pool. It was large enough to move around and not feel at all cramped. The unit is less than 10 mins from the airport and no more than 15 mins from the city center/ Duval St. I would highly recommend this property to others and would stay there again. Hello Rhiannon, Thank you for your feedback and we are happy to hear that enjoyed your stay. We are glad to have been able to modify your stay. We loved the condo. The location was close to everything we wanted to be near. The condo was clean with a beautiful view of the pool. Hello Misty, We are glad you enjoyed your stay! Hello Lori and Randy, Thank you for your feedback. We are glad you enjoyed your stay. I was skeptical about the rental being in Stock Island but found that it was actually pretty easy to get around. It was easy to get to & from the airport & a short drive to everything else. Not within walking distance to the downtown area but there are public parking lots where you can park for the entire day. The rental was very clean & perfect for six adults. The gated community was nice & the pool area was great. I would recommend staying here to anyone & would stay here again. Hello Dava, Thank you for your feedback. Hope to see you again soon! The property was perfect for our group of 5. The unit was exactly as pictured and having the pool right off our porch made it easy to go for a swim any time we wanted. We enjoyed going to the Hogfish Grille and the Roostica restaurants several times especially since they had great food and were close by. Easy to get to everything in Key West but we did have a rental car. We especially enjoyed the Zachary Taylor State Park for swimming and a picnic lunch. Chairs and umbrellas are available and good snorkeling right off the beach. Would go back for sure. Hello Marcia, Thank you for your feedback. We are happy to hear you enjoyed your stay in Key West. Hope to see you again in the near future. Great condo complex. The photo's we're exactly what we expected. This condo is right next to the pool with a nice size deck. We enjoyed waking up on the patio and ending the night there too. The owner Vinn was very friendly, texting questions & concerns. We had 6 people and it was the perfect size. We would rent the condo again. Hello Thomas, We are happy to hear you enjoyed your stay. Hope you come back again in the near future. Hello Mark, Thank you for your review, we greatly appreciate it. My two friends and I had a great time at this rental. The place was immaculately clean and it had all the amenities we needed. The pool being only feet away from the back porch made this even more special. The location of the property to Key West was not a problem. It gave us an opportunity to relax after a day of walking and sight seeing. I highly recommend this property. Quiet, convenient, relaxing and away from the hustle and bustle of tourists. Definitely would stay at this location again. 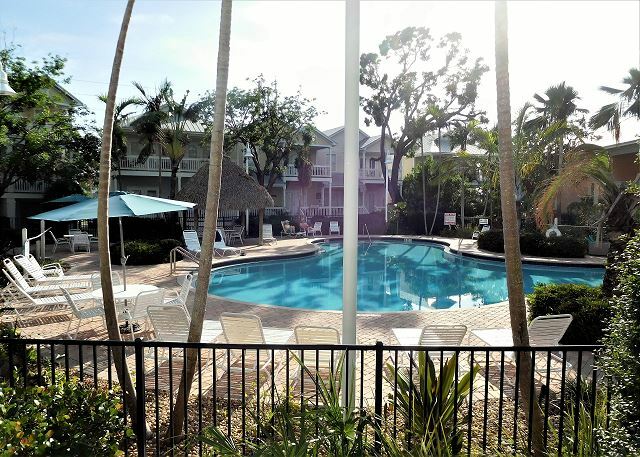 We have stayed in three of the available units in Coral Hammock and all have been great. we were in Key West for a family wedding over Labor Day (before any bad weather thank goodness) therefore we had 7 homes on Stock Island rented. The area was very nice & all the homes were convenient to each other & the pool. We loved the set up of this location. A few things regarding our rental: the unit was very musty smelling which did not help any of us with allergies. Because of the dampness we could not keep cereal, bread, crackers etc. in cupboards & had to throw them out. Most of the dishes & drink ware were plastic. I agree plastic should be used by the pool but would have liked at least a couple of real wine glasses for inside to use. (we are responsible seniors)Having said this, we would rent this unit again & did enjoy our time there. Just a few suggestions. It felt like like a home away from home! We stayed at 34 Coral Hammock and thought the accommodations were perfect for us. The condo was well maintained and clean. The location by the pool was an added bonus. We did notice most of the other units had a grill and that would have been a nice addition for our large family of 6. Very Happy, would stay again. Unit was clean, beds very comfortable. Kitchen well stocked. We did have a slight problem with sugar ants in the kitchen (but could be time of year). Just made sure food was put away. Loved the huge porch over looking the pool & loved that each bedroom had a private full bath. Grounds & pool are well maintained. We had a large group for the week and several units rented. All of us were happy with accommodations. We would definitely stay again. Location was excellent...all of the other times (50? )I stayed mostly in Oldtown. Because this was the first time with grandchildren (three boys! ), I opted for something a little less crazy and more secure. Nearby,like across the street, was a newspaper kiosk, and three nice stops. which we enjoyed very much with the fish we caught on our boat from Dolphin Charters, also on Stock Island, only a mile away. As an aside, the tarpon and shark feeding there was far superior to Robbies, w/o the cover. We used the pool almost every day, often with only a handful of people there, or by ourselves. at Fort Zach, where we rented equipment. I should mention Key West is not for the financially faint of heart. Fished at FZ also, along with Higgs Beach pier, caught small stuff, but we were fishing the wrong times and tides, and it didn't matter anyway. Sand and some shade from the palms at Smathers Beach was very nice, after the somewhat rocky shoreline at FZ. Mallory Square sunset/performances was fun, especially when we found out no one cares about open containers...Other touristy stuff, Southernmost Point, Butterfly Nature Conservatory, Ripley's were all fine. Back on Stock Is our last night was at Hurricane Hole, where we got a waterfront table right away, and had some decent fish & chips. Remember, Publix, and CVS, ridiculously close, are your friends .We were there five days, and happy, tired, and broke, reluctantly said goodbye, and we were planning our return while we were driving back! Hello Stephen, Thank you for your review, glad you enjoyed your stay and for all the great feedback. See you again soon in paradise. My family and I rented this property for a week and all I can say is that the pictures do not do justice on how beautiful the property and pool area are. The pictures, do however, live up to their expectations and the town home was very spacious and clean. Each bedroom had its own bathroom (shower&toilet) included and feeling cramped was not an issue. The washer and dryer came in handy although it was a little small. Each bedroom had a backdoor that opened to a view of the pool which was literally no more than 15 feet in distance. We had an issue with the main light bulbs going out and after calling the emergency number on the fridge it was taken care of within hours. The television in all the rooms, including the living room had tons of channels to watch when it was time to wind down at night. For the most part, it was a quiet little area although there were some partiers that came the last day of our stay, but they seemed to wind down at a reasonable hour. Overall, it was well worth the money and the location was probably the best part of our stay due to the location of the townhouse. It was about 10-12 minutes away from the marina and duval street. I would highly recommend this property to anyone visiting key west and we definitely plan on staying here during our next ket west adventure. Excellent - clean, great suggestions for local activities, awesome pool! A perfect retrear for a Key West vacation. Condo was exactly as described. Clean and convenient to Key West. Wish seating area around TV could accommodate the same number as the bed. That being said dining chairs were comfortable enough pull ups. Hello LeAnne, Thank you for your feedback, we greatly appreciate it. Hope to have you and your family stay with us again in the near future. A great townhouse to rent. We had 6 adults and the 3 bedroom and 3 bathrooms made everyone's stay very comfortable. The house had everything we needed from beach towels, cooler, plenty of silverware, glasses, plates, etc. It is very convenient to key west by car or taxi. We even had bikes delivered to the door for $10/day. There is a large CVS store across the street for any provisions you may need including wine and beer. The pool was quiet and clean. Great to relax and get into a vacation novel. Definitely recommend it to a family or a few couples. It would cut down the cost of your vacation lodging significantly. Fort Zachary Taylor park beach is a must see. Hello Lucy, Thank you for your feedback, we greatly appreciate it. Glad you enjoyed your stay. 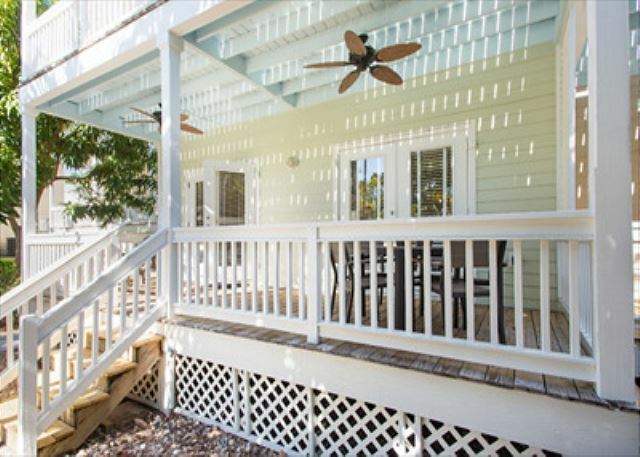 This property is a great location, away from the hustle and bustle yet close enough--about 10 min from downtown Key West. 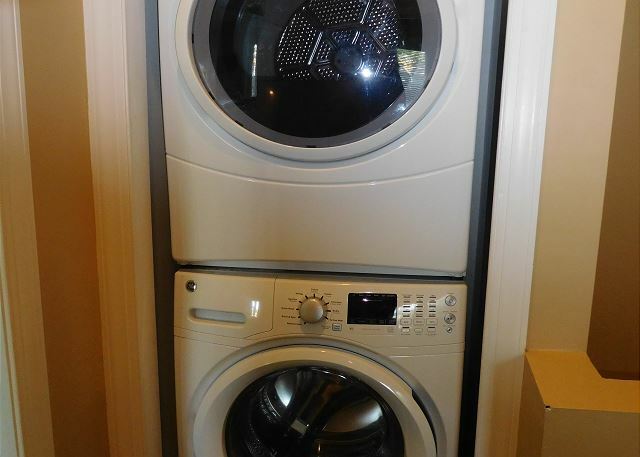 The property is well maintained and the condo was very clean. Beautiful view of the pool with the pool just steps away. I would definitely recommend this unit. Hello Kathy, Glad you enjoyed your stay. Hope you come back soon. Our stay was wonderful. The unit is much larger than I had imagined. Plenty of space for our family. It was very tastefully decorated and being so close to the pool was great. It is in a great location, a very short drive to the grocery store and Key West and about a 20 min drive to Cudjoe. The staff was great at responding quickly to any questions we had. The only downside is there wasn't a grill to cook our fresh catch on, but we knew that before our stay and got one when we got down there. Loved being next to our family in the unit next door!! Hello Crystal, Glad you enjoyed your stay. The process of booking was easy; Becky was a pleasure to work with and always provided a quick response. The house itself met expectations- very clean, beautiful grounds (great pool), easy to get in and out of and I would consider it to be very reasonably priced. We were a group of three couples and everyone thoroughly enjoyed the stay! Hello Elizabeth, We are glad you enjoyed your stay. Hope you come back soon. Stayed for six nights and couldn't be more pleased. Condo is nice and roomy and spotless. Entire complex was spotless. It's quiet and the grounds are shaded with lots of trees. We have NO complaints. And it's RIGHT by the pool. Air worked great and mattresses were so comfortable, we took the name down so we can buy us one for our home!! Everything you could possibly need is there, too. Excellent communication with both owner and management company. JUST BOOK IT!! Hello Sheri, Thank you, we are so glad to hear you enjoyed your stay. Hope to have you stay with us again in the future. We had a relaxing / drama free vacation @ Coral Hammock 34. Our contact made it clear she was available if needed & indeed answered her cell phone after 6pm on a Saturday evening.& was most helpful. The patios are like extra rooms with a nice view of the pool- if you look thru the palm trees. No complaints. Rent w/ confidence. Everyone in this gated community were nice & respectful of others and the grounds. We will definitely check availability when we visit The Keys again. Hello Tim, Thank you for your feedback, I am glad I was able to assist you in check in and hope to see you again soon. Hello Maurice, Thank you for your feedback. Glad you enjoyed your stay. The townhouse was very comfortable, clean, great location for us- a short drive to restaurants and attractions. The pool was great! Loved our stay! This condo has an excellent location poolside. Loved the porch and balcony, and the unit was clean and comfortable. Vin and staff were kind and professional. I would definitely recommend to others! Hello Lisa, We are very happy to hear you enjoyed your stay. Hope to have you and your family stay with us again in the future. Very nice facility. Would stay again. Have a couple recommendations...more towels and wash cloths. Frig quit and we lost some food. It was clean, and everything we would want in a vacation rental. Hello Don, Thank you! We are glad you enjoyed your stay. Hope to see you again soon. This home was very well kept and stocked with all the amenities we needed. Easy to access and streamlined check in / check out which was exceptional during the vacation. We will definitely be coming back next year for our stay. Hello Cara, We are glad you enjoyed your stay. Hope to see you again soon! The condo was beautiful and met our needs perfectly. The three bedrooms/baths were good, relaxing on the patio overlooking the pool was great, and the location away from the hustle/bustle of Key West, but close enough to get there in 10-15 minutes was perfect. We liked watching the geckos hanging around, but don't park under a tree or you will be needing a carwash! Also, I loved the rattan easy chair visually, but it wasn't the most comfortable way to watch hours of Turkey Day football. We did have an issue with the main TV, but Key West Vacation Properties (Becky) did a super job of taking care of it quickly. All in all, we'd come back! Hello Ken, Glad you enjoyed your stay. Thank you for your feedback we greatly appreciate it. Hope to see you again soon. This one had nice poolside decks up and down. I do wish the upstairs deck had ceiling fans like the lower deck. If you are planning on visiting Old Town much be prepared to have ample cab fare. A minimum of 4 people are required to take advantage of the somewhat softer fare. We had one single that stayed late at the residence and was popped for $28 to get to Mallory Square. Four of us got there for $26. A sign explaining the rates for multiple riders is affixed to each cab. To/From zone 4 (Stock Island where the residence is located) is $6.50 per. We had one try to tell us $7.00/per and she lost a nice tip. We are seasoned KW travelers so we were very prepared to pay the price. The Hogfish Bar and Grill (fantastic food and service) is within walking distance but the neighborhood you have to walk through might be a bit unsettling to some. But we had no issues. Hello James, Thank you for your feedback. I will pass the information on to the owner about your suggestions. Also thank you for the information on the cab fares. Hope to see you again soon. Nice property in a good location. Some of the furniture needs replaced. Hello James, Thank you for your feedback. We are glad you enjoyed your stay. Four friends and I stayed six very relaxing nights here. The owner and management team quickly responded to inquiries. The property (interior and exterior) was very clean, well maintained, and located perfectly across from the pool. It's in a gated community that's walking distance from at least four awesome restaurants, a deli, bicycle renting shop, local grocer, and pharmacy. The maintenance crew or manager was on site daily. It was a perfect getaway after enjoying the Key West sites! Hello Sherron, Glad you enjoyed your stay. Hope you come back again soon. Excellent, everything was as show, in great condition, clean and well laid out. Hello Salvatore, Thank you for your feedback. Glad you enjoyed your stay. The place was so clean. They provided a lot of extras. Great location. We plan on going back. Hello Martha, We are glad you enjoyed your stay. Looking forward to having you stay with us again. We had a grateful time on our vacation, the location was wonderful and the pool right outside the front door was great. The unit itself needed a little updating. Other than that we had a great time. Hello Sandy, Glad you enjoyed your stay. Thank you for your feedback the owner was just here this past week and he did some updating to the unit. Hope to have you stay with us again soon. We had a great time spending the week here at Coral Hammock. The condo was clean and with 6 adults it was nice to have your own bathroom off your bedroom. Will definitely be back. Hello Andrea, We are glad you enjoyed your stay. Hope to see you again soon. Hello Charles, Glad you and your family enjoyed your stay. Hope to have all of you stay with us again soon. This is a vacation paradise. Gated location and beautiful landscaping. Walking distance to a CVS pharmacy and two restaurants(italian & mexican). This three bedroom/bathroom is spacious and very clean. The living room, patio and all bedrooms overlook the pool which was very relaxing during the day or night. No reason to over pack, having a washing machine/dryer at this location. We were greeted daily by "Rudy the Rooster". The men went fishing and was impressed on their catch. Sight seeing, shopping for multiple bargains, walking the beach and lots of laughs fulfilled our week. Sunsets are unbelievable. Taxi reasonable at $6/person to downtown Key West. Thank you for making this vacation memorable. You will definitely see us return in the near future. Hello Julie, Thank you for your feedback it is greatly appreciated. We are glad you enjoyed your stay and look forward to having you stay with us again soon. A great place in a very comfortable complex. Hello, Glad you enjoyed your stay. Please visit us again soon. The unit is great. Starting with porches upstairs and down where you can relax and enjoy the quiet. Walking trails across the street. Convenient store across the street for whatever your needs might be. Three couples had plenty of space to spread out with their own private baths. A roomy kitchen. Convenient access to Key West yet far enough away to avoid the congestion. Great neighborhood restaurants. The showers in the unit could be regrouted or thoroughly cleaned to remove mildew and the experience would rival a 5 star hotel. Well worth the money. Hello James, Glad you enjoyed your stay and hope to have you stay with us again in the future. Thank you for your feedback we greatly appreciate it. The condo we rented was awesome!! It was a 3B/3Bath which was perfect for our family. It was like walking into my own home. Everything we needed was there!!! Our condo was also located in a great area. You walk out on our back deck and the beautiful gated pool was a few feet away. We truly enjoyed our stay in this beautiful gated community. It was nice and quiet and the other people around us were very friendly. I would definitely go back to this community. I actually didn't want to leave!! !If we had the opportunity I do believe we would invest in a property just like this!!!! Hello Evelyn, Glad you enjoyed your stay and we hope to have you and your family stay with us again in the future. We have never been away from home at Christmas, but this year we joined our children for a memorable week in Key West. We much prefer the accommodations at Coral Hommock on Stock Island over the hotels in Key West. We loved the pool view, spacious verandas on first and second floors, well-equipped kitchen, tv's in all bedrooms and living room, uncrowded and peaceful atmosphere, parking at our front door, beautiful decor, and convenient location. 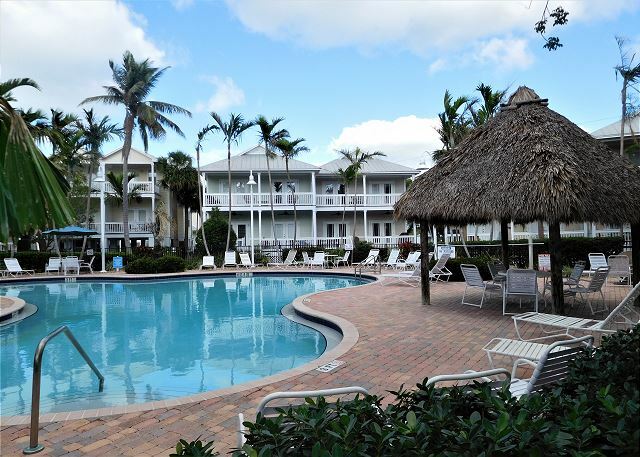 We enthusiastically recommend Coral Hammock 34 for your stay in Key West--you don't be disappointed--great value! Hello Laura, Glad you enjoyed your stay and that you had a great Christmas in Key West with your family. Hope to have you stay with us again in the future. My wife, two adult children and I were looking for a place where we could get away from the northeast weather and have a relaxing stay that also offered good outdoor activities. We found the Coral Hammock a perfect place for meeting our needs. It was only 1/2 mile from Key West, which allowed us to drive or bike into downtown to enjoy all the ecclectic charm of Key West, while also getting away from the bustle of downtowm when we wanted to relax at night. We also spent some time at the pool, which was lovely. Also, we have many dietary restrictions, so having the full kitchen at our disposal was important. The condo was clean and had plenty of room for the four of us. Locally, we used the following vendors and would recommend them: Lazy Dog for a wonderful kayak/snorkling excursion to the mangroves (Robin was great), We Cycle for the bike rentals, Roostica (had a nice gluten free menu) and the Hogfish Grill. We also used the Publix market on Key West for our groceries. Hello Kevin, Glad you enjoyed your stay. Thank you for your feedback we greatly appreciate it. Hope to have you stay with us again. Great property. Owner and property manager were great to work with. Property is in a great location just outside of Key West. Pool was amazing. Can't wait to return next year!! Hello Kelly, Glad you enjoyed your stay, hope to have you stay with us again soon. My husband and I and 2 other couples stayed in this rental and it was absolutely perfect!We felt like we had the whole place to ourselves. I would definitely stay there again and recommend it over a hotel anytime. The location was convenient-out of the way but not too far away. The townhouse was well stocked with everyday necessities and very clean. We also fell in love with Roostica, a pizza place across the street that served fantastic pizza. Would only suggest ceiling fans outside on the deck and more chairs for the deck as there are only 4 and the place sleeps 6. Hello Fiorentina, Glad you enjoyed your stay. Thank you for your feedback we appreciate it and will pass it on to our owner. Hope to have you and your husband stay with us again soon. I y was our first time in KW And it was a great vacation, we need it more time to do everything we wanted. Hello Jose, Thank you for your feedback. Glad you enjoyed your stay and hope to have you stay with us again soon. We had a fantastic time and would recommend it to anyone. Hello Anna, Thank you for your feedback. Glad you enjoyed your stay and hope to have you stay with us again soon. The overall stay was experience was good. Hello Sherrie, Thank you for your feedback. Glad you enjoyed your stay and hope to have you stay with us again soon. Clean and well-maintained property. Good size for up to three couples. Convenient to all activities, attractions, and restaurants in Key West. I would recommend this property to friends and relatives. Hello John, Thank you for your feedback. Glad you enjoyed your stay! The house was lovely and location perfect for easy access to downtown Key West. We enjoyed the pool, though I might suggest 2 keys, just because every time someone else came out, someone would have to get out of the pool & give them the key to get in. The beds were very comfortable, bathrooms great & it was nice having sheets, towels, and all the other amenities there for us. Since the house is set up for 6 people, the only problem we found was that there was not seating for even 4 to relax in the living room area. One sofa & a chair was enough for 3, but for all of us to watch the soccer game, someone had to sit in the dining area. It isn't a big area, so I'm not sure how to fix this, but if someone wanted to rent this for 6 people it would be extremely crowded in that living room area. The blender could do with changing - blades are worn, but good supply of kitchenware. Overall, we really liked the place. The inconveniences were small and didn't impact our enjoyment of the home. One more thing; we left a bunch of coupons, magazines, etc. It is nice to have that, especially when you arrive late & can't get to the Visitor's center. Just a binder/folder with restaurants, excursions, etc. would be nice. Since there were not any other instructions other than to take out the trash, we did not wash anything, which I assume was okay. It would have taken a day to wash all the towels in the small washer/dryer so we assumed that was handled by management. Thank you. We loved the house and would recommend it to others. Hello Bonnie, Thank you for your feedback we greatly appreciate it. We do have a check in package which included brochures, coupons, etc.. but since this property is only one of the two which is key-less and to not inconvenience the guest we have you go straight to the property. We will include those in the property as that is a great suggestion. You are correct all that is required at check out is to take out the garbage. We handle the rest. Glad you enjoyed your stay and hope to have you and your family stay with us again in the near future. we attended a wedding in Key West and stayed for a week after! it was fun, but being June hot and humid! this house was very well kept, very comfortable, and very relaxing. the pool and grounds were cleaned daily, and were a great place to cool off. location was far enough away from downtown yet very convienient to Rt 1. nearby restaurants were very good. Hello Dan, Glad you enjoyed your stay. Hope to see you again soon! Everything was great - booking, arrival, facilities and location, and check out. Hello Jerrold, Glad you enjoyed your stay! Hope to see you again soon. It was very nice - clean, great pool, private, convenient location. Hello Tom and Maureen, Glad you enjoyed your stay. Hope to see you and your family again soon. This property helped make our visit to Key West special. The family was able to stay together a short distance from the hub of Key West. Comments from everyone staying were positive -- "great find." Hello Stacey, Glad you enjoyed your stay. Hope to have you and your family stay with us again. Hello Colette, We are glad you enjoyed your stay. Hope to have you and your family stay with us again soon. Great stay but could use a grill. Hello Bill, Glad you enjoyed your stay. See you again soon! Grills for vacation rentals are against condo association guidelines due to liability issues. I didn't mind the stay other than the rooster that would ****-a-doodle at random times in the night. Hello Vanessa, Glad to hear you enjoyed your stay. Hope to have you stay with us again! We were very satisfied with our rental unit. Nice furnishings and loved being right by the pool. Communication with Key West Vacations was great. Hope we can come again next year. The unit did need more washcloths; could only find 5 and there were four of us. Hello Debbie, Thank you for your feedback, we appreciate it. I am glad you enjoyed your stay and I apologize about the wash cloths, I would have been happy to take care of that immediately during your stay. Hope to have you stay with us again in the future. this townhouse has everything one needs. The pool just outside the door was a plus as was the large porch. a grill would have been nice, but we understand the problems that might pose with renters. neighbors were very friendly and helpful. The rental agent, Becky, anticipated our every need. The location is just outside of Key West on Stock Island which was great since we enjoyed driving to Bahia Honda State Park and not having to wiggle through Key West traffic to get out there. we were able to ride bikes into town, about a half hour ride using back streets which gave us a feel for the non-tourist parts of town. we also were a quick bike ride away from the botanical gardens, which was a great place to visit. Just don't go beyond the park or you will see the ASPCA and come home with an adopted pup! Hello Nancy, Glad you enjoyed your stay and hope to have you and your family stay with us again soon. For the 5 people involved in the getaway vacation the property was well-laid out for living and bedroom/bathroom space. The fine pool and tropical landscaping made each day very pleasant. Drives to downtown Key West and local restaurants were not at all inconvenient. A very good experience. Hello Richard, Glad you enjoyed your stay, hope to have you and your family stay with us again. Good location with a swimming pool and lots of decks. Very pleasant setting. Kids loved the arrangement with 2 twin beds and their own bathroom. Close to restaurants and walking trail. Hello Marion, Glad you enjoyed your stay. Hope to have you and your family stay with us again. Stayed here for 5 nights with my family (two adults and two children). The house is welcoming and well maintained and the set-up with the pool just off the back porch is great. The surrounding garden is pretty and the pool area is perfect. About a ten minute drive into Key West. Good restaurant just across from the house called The Roostica that we ate at twice. Would do it all again. Hello Claudine, Glad you enjoyed your stay. Hope to see you and your family soon! Great place to enjoy Key West or just hang out! The unit is set up well. Good location, fairly quiet. Easy access to Hwy 1, plenty of parking. Gated community is easy in and out. Grounds are well maintained and the deck is steps from the pool. Cab ride is $18.00 or $5.00 per head which ever is more. Good restaurant across the street in case you want to skip downtown. Enjoyed it! We will rent this unit again on our return to Key West. Hello Jody, Glad you enjoyed your stay and hope to have you and family stay with us again in the future. Happy Holidays to you and your family. We rented this property for a Girlfriend's Get-Away. The property was amazing. The pool was perfect and we were just steps away. Very quiet and relaxing. Had everything we needed there. The only negative thing we saw was that it was quite a ways from Duval Street -- however, this was also considered a benefit! I would highly recommend this property. We absolutely loved this rental!! There were 6 adults on our trip and the house offered perfect accommodations for all of us (a bedroom with attached full bath for each couple). The house was very very clean and had everything we needed. 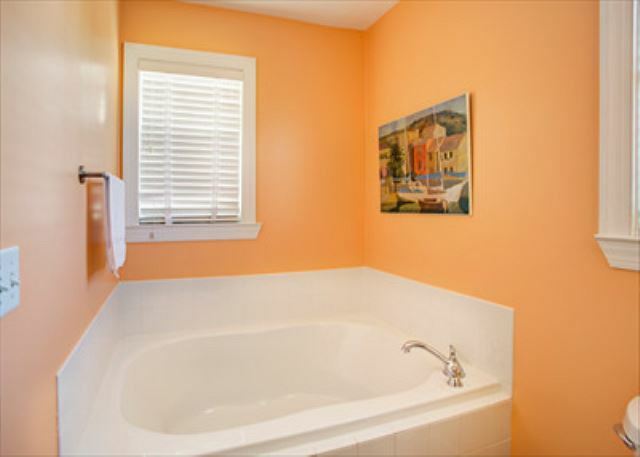 The master bath even has a huge garden tub. The house is situated at a great location within the gated community, with excellent views of the pool and beautiful landscaping from the porch. We loved that the house was located on Stock Island. It was very close and convenient to downtown Key West but removed enough to get away from the "party scene" and relax in the pool or on the porch. I would warn anyone coming to Key West to bring ear plugs. There are feral roosters that start crowing around 3am. However, this seems to be all over the island and not limited to the rental grounds. We would definitely stay here again. Property overall was nice. Quiet complex. Pool could have been kept a little cleaner. Nice poolside view, wish it had ocean view also. Convenient to the golf course which is nice. A fan on the deck overlooking the pool would be nice. We had an awesome time in Key West. It was our first time. Loved the location & layout of the house. While not in downtown area, wasn't too far and had no trouble finding on street parking. Would recommend this to friends! People were very friendly and helpful. Kids loved the pool. A grill on the deck would be nice though. Nice but lacked a few things. 34 Hammock is nice, clean, and well furnished. There was 7 of us and the place had 2 washcloths. Beach towels provided. No TV in 2 of bedrooms. We did some cooking and baking. There was only one baking sheet. You have to drive to get to everything. Beaches are poor in Key West. My family stayed in this vacation home for one week in July. It was very clean and kid friendly (my sons are 9 & 7). It was also centrally located providing easy access to surrounding attractions. The owner and rental agency were very helpful and friendly. We spent a lot of time at the pool as we found the beaches to be rocky and full of seaweed. A word of caution - stay away from Duval Street at night if you have small children. The crowds get pretty rowdy. Overall, a very good experience! We had a great time. The facilities exceeded my expectations! I would seriously consider renting this property if I take another vacation to Key West. Only downside was that I thought it was on Key West proper but is was close and location did not present a problem. Hello, Thank you for your feedback we do appreciate it. I apologize for any inconvenience and we would have sent our maintenance man over right away to fix the handle of the night table along with the drawer. If no wash cloths were in the unit we would have had someone deliver you some immediately. We have advised the owner about the carpet and it is scheduled to be replaced in September. We have also advised the cleaning company about the stove drawer. I will check with the association but as far as we know it is against condo association rules to have grills on property. Unfortunately, the association is responsible for the lawn care but I will advise them of how you were inconvenienced. Hope to see you and your family again soon. We had a great stay at this rental. We were awakened very early a couple of mornings (before 7) with sounds of a leaf blower and roosters! Overall a great stay. We were on this year's annual joint vacation with my husband's brother, sister and their spouses - a first in Key West for all. This condo worked well for us. The owner (not in KW) was easy to deal with and quickly responsive via e-mail to any questions. It is a gated community and the condo has keyless entry so there were no keys to keep up with/have to return. The condo was very clean, has a well-equipped kitchen if you want to prepare meals. The pool is a nice size, was cleaned daily, and has steps descending into it for easy access. The condo common areas were also very clean and well maintained. A car is needed to fully enjoy the area, but good grocery stores and restaurants (national chains and locals) are available within a mile or so of the condo. Hogfish Bar & Grill (seafood) and Chico's Cantina (great fajitas & margaritas) are on Stock Island and very good. Roostica wood fire pizzeria was less than a block from the condo and well recommended but we never made it there. Near-by chains included Outback, IHOP, Five Guys and Waffle House. It is an easy trip into Old Town KW and while you have to pay to park just about everywhere ($2/hr on-street kiosks & meters, $13 all day at city deck with free transit use with parking) )it is readily available. City View Trolley had the best prices, gave a good tour of the city and is hop on/hop off. Be sure to go to Ft. Zach Taylor for swimming; the lighthouse and Ernest Hemmingway House - right across the street from each other - are worth seeing, go to the Green Parrot for Rum Punch, and of course there are lots of bars and activity up and down Duval St. The nights we tried to see the sunset at the pier we had too many clouds but the surrounding activities are fun (although the trained cats weren't there when we were). Duffy's Restaurant on Truman was very good for a nice meal. This was our first trip to Key West and we will most definitely be back, hopefully soon. The actual location of the condo is in Stock Island but was less then a 10 minute drive to get everywhere. We had 3 older kids with us (18,17,16) and they all loved it. The condo was great and the pool was wonderful. We enjoyed our vacation very much look forward to our return trip. Great place, lovely accommodation and complex layout. Needs more sun beds around pool but otherwise faultless. Stay was very nice. This property is actually located on Stock Island which is like 1 mile from Key West. Hotel pool was beautiful and was two steps from our living room. The townhouse had many ammenities from home including very comfortable beds. It was a great and relaxing stay! Great location out of the crowds, yet easy to get anywhere from. Loved having the pool right out the back door. It was a little cold and overcast while we were there, but it did not deter us from enjoying the area. We enjoyed a 5 night stay at Coral Hammock's 34. The location is very convenient and quiet. The pool and grounds are lovely. Our condo was clean and furniture in good condition. This condo overlooks the pool and a skip away from the pool. The bathrooms just need some more hooks or towel bars! Just to keep towels off tub and shower. We were able to get late check out to go with later flights of our guests. Thanks for honoring that special request. a guest from Rochester,, NY does not recommend this vacation rental. It would be nice if the listing told it was on Stock Island rather than in Key West, but the location worked okay since we had a car. Key West is a fun place and we really enjoyed our stay. We would stay there again and recommend to friends. Location was great. Close to everything. We had three couples and we all had our own bath, which was nice. Gorgeous pool and surrounding area. I liked the grated community. Beautiful weather all week! Hello Donna, Glad you enjoyed your stay. Hope to see you again soon. The rental company & representatives made my trip experience the best. I had one business conference call to conduct and they made sure I had WiFI issues resolved timely and offered a back up location just in case. The condo was clean and outfitted for the group we had. Wonderful experience and will definately use them again next year. Hello Roxanne, Glad you enjoyed your stay! Hope to see you again next year. 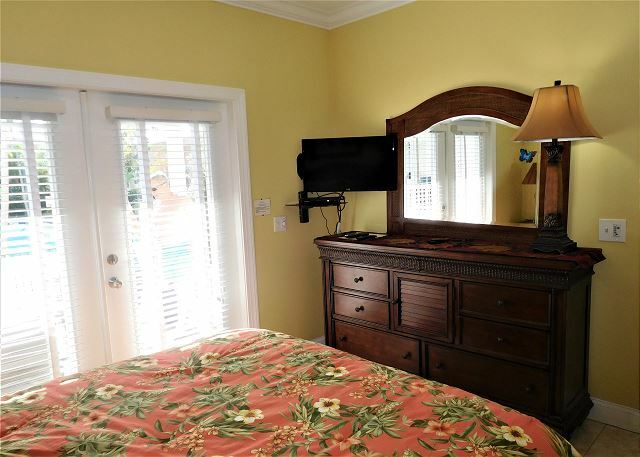 Location provided an easy access to Key West and to destinations to the North.Property was well maintained and the town home provided all the comforts of home.Great place to stay. Cute beachy condo in great location! We really enjoyed our experience in this condo. It had everything that we needed including the neighborhood rooster and black and white cat "Tuxedo"
We were extremely happy with our stay at Coral Hammock #34. The condo was beautiful and clean. It was just like the pictures online. We plan on coming back again and staying longer. 34 Coral Hammock was a great place to stay. We had our daughter and son, both in their early 20s, plus our daughter's boyfriend with us. Everyone had enough room to stretch out. The view from the deck onto the pool was so enjoyable for both breakfast and happy hour. We would rent this townhouse again and would highly recommend it. Second year staying here, what a wonderful vacation home! This was our second visit to Key West and this time we took our family and the stay was great. Our first visit we stayed in a ****** hotel but this second stay at Coral Hammock was wonderful. The house was in a gated community, we had access to the pool right outside our back door. The house was very clean and only 5 mins from Duval. A storm through out our cable and the property manager (Jamie) came right away to fix the issue. The staff is very professional/helpful and we will stay there again and highly recommend the stay to anyone else. Hello Adrienne, Glad you enjoyed your stay and hope to see you again soon! 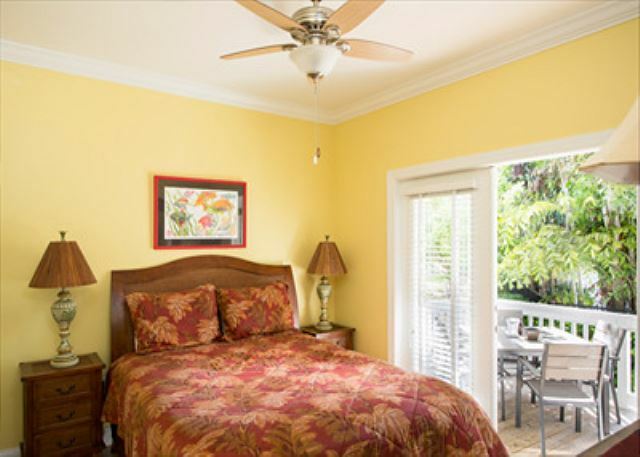 Coral Hammock is simply perfect for a family stay in Key West. The location is far enough away from the hustle and bustle of Duval Street but close enough to enjoy everything Key West has to offer. Coral Hammock 34 was perfect for our family of 5 and the pool is lovely. We enjoyed sitting on the back deck in the evenings while the kids swam and we watched the chickens and the iquana's. Every morning was spent riding bikes all around the island. We would definitely return to Coral Hammock! The house was very clean and our family enjoyed the stay. the visits at that property was very good very clean everybody is friendly we had no problems whenever me and my family come back to key west I will recommend him to stay there. Coral Hammock 34 is a great place to stay. Finding a quality place to stay downtown in Key West is not easy. After almost giving up, I found Coral Hammock located only 5 miles away from the action. The unit, the pool, and the clubhouse was very clean and inviting. The other guests and residents were very friendly including the iguanas and roosters that served as our alarm clock. I don't think I could have found a better place to stay than Coral Hammock. Will definitely recommend to family and friends. We were extremely satisified with the property. Everything was as described. The pool was great, everything was immaculate and and comfortable. If I had one complaint it would be we could have used a few baking pans. (We just bought disposable, so it wasn't a big deal). We would definitely recommend it and/or return. I thought the home was beautiful and it was really just a couple of steps to the pool. It would have been nice to have a safe in the house somewhere to put things when we went out, but all in all it was fantastic! I have not been to Key West in years and recently came in for a wedding. We spend a lot of time in Islamorada just fishing, diving, relaxing and pretty much avoid coming all the way down due to how commercialized everything on or around Duval has become... Purposely looking for a place a few miles north, we found you guys. The unit was beautiful, the property maintained well and the management staff was extremely helpful and friendly. We will definitely stay again the next time we're down there and have already recommended the property to several friends.